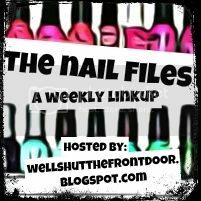 jennie's nails and tales: The Nail Files: A Sunsational Success! Three weeks ago, something very bad happened. I went to Sally's to check out the China Glaze Sunsational collection when upon my arrival, the manager looked at me, teary eyed, and told me that it wasn't being shipped to Canada. When she'd first heard the news, she couldn't believe it either so she went to the fancy beauty supply store where you need a license...but they were also sans Sunsational. Don't panic, I told myself. You can just buy them from Amazon but when I went to finalize my order, a terrible message popped up that stated: RESTRICTED ITEMS, CANNOT SHIP TO CANADA. Naturally, I cried hysterically for hours was sad. And even worse, because I couldn't have them, suddenly they became the most beautiful colours of all time and I was left no other choice but to send an email to Canadian Customs inquiring as to why they would be so willing to ruin my life deprive me from The Most Beautiful Polishes Of All Time. Okay, I didn't really do that but I did think about it. A lot. But then, something AMAZING happened! I found out about Polish Canada!! I don't know how they did it, folks, but they managed to get their cute manicured hands on the Sunsational collection and two days after I placed my order, my colour dreams turned into a reality. 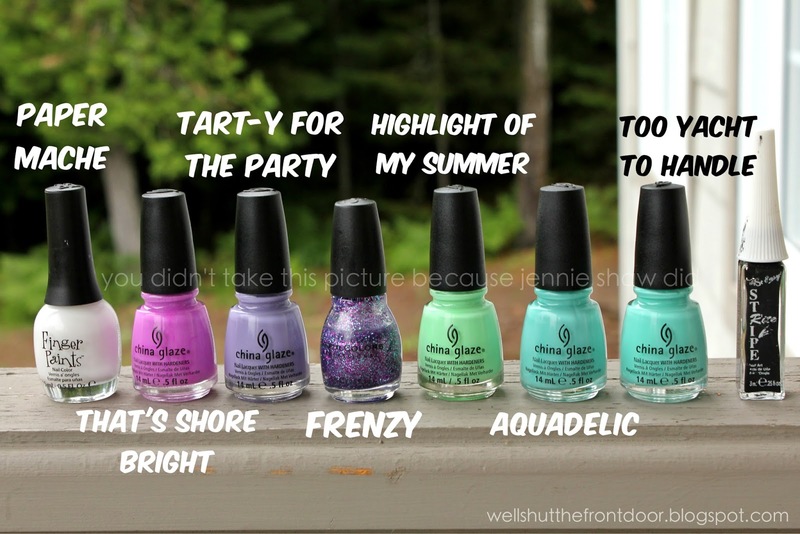 The SUNSATIONAL collection includes That's Shore Bright, Highlight of My Summer and Too Yacht to Handle. My order also included Tart-y For The Party and Aquadelic. I couldn't decide which ones I wanted to use and thanks to Pinterest, I found a cute design that showcases all of them! Obviously, I needed to add a little sparkle but aside from that, I pretty much just copied the Pin. Ha! The tracing on my right hand isn't nearly as smooth as it is on my left but if you have a steady hand then it's worth giving it a go! Happy Friday, everyone! I can't wait to see what you're rocking this week! *gasp* I was just about to run to ULTA and get the collection for you, and smuggle it into Canada! Well, except that I'm in my pajamas, and ulta isn't open. But fer sure I was gonna help my girl out!! Love this manicure - I remember seeing the original when it was first posted. Glad you were able to track down the polishes. I would have never know how difficult (and more expensive) it is to get makeup and polish in Canada if I hadn't started reading beauty blogs! Seriously. My hands would look like I let a toddler loose with a marker if I tried something like this. I love love LOVE it! And the glitter on the ring finger? Perfect! Wow your nails are gorgeous! You really did an amazing job. Glad you were able to hunt down your colours! Totally worth it!! Great job on these, they look awesome! Did you use a black sharpie with that, or what? It's awesome! Those colors are beautiful, I'm glad you managed to get your hands on them. Or... managed to get them on your hands. I'd LOVE to see how the heck you did that manicure!! All those China Glaze polishes are so pretty. That came out so cute. Love it! Glad you were able to find it! Love the colors and your nail art! This looks amazing! Never a dull manicure on your page! So cute! And I love the addition of some sparkle! Love the mani as always and thank you for hosting! !